Seems like more than a few caregivers have asked about anger management for Fetal Alcohol Spectrum Disorder (FASD) lately, and frankly it’s a daunting subject to blog about. Sometimes techniques just work a few times (if at all), or they’re designed for an age too young or too old, or they’re too complicated to pull off at a moment’s notice, or we forget to use them at all even! The biggest challenge, though, is that real anger management (with or without FASD) only happens when the angry person is not angry! Because we’re often exhausted from the rages (and everything else!) and want (need?) to avoid more stress, anger management work gets pushed aside so we can rest or we turf it to the therapist or school social worker or we wish the kid would just act better. Believe me—I know! 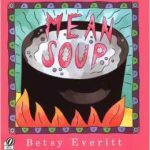 Making Mean Soup whenever you get angry. However, a kindergarten teacher I know recently came up with a good idea that I want to share. I know it’s too young for some and too old for others, but there’s two basic principles she used that I think can be generalized and tried with other ages.